One of the things that I’ve always found most difficult in German is remembering the different prepositions and relative pronouns and using them correctly. However, thanks to last week’s lessons (which unfortunately I did not have much time to comment on) I feel that I am slowly starting to get it. I am currently working on a written assignment for class in which I aim to apply my new knowledge and hope that I have learned something after all. Either way, with my confidence regained, I believe that now I have all of the sufficient tools to be able to write a decent German blog entry (hopefully by Thursday!). This entry was posted in Mein Deutschkurs on 21. September 2010 by Lev. 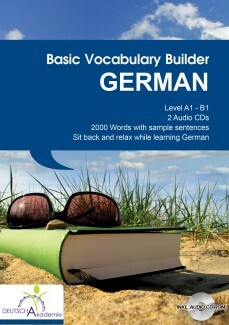 Today I’d like to go over a nifty little product called “Basic German Vocabulary Builder”. While testing it, I found that it’s a great tool for the beginning German student who wants to learn basic phrases and useful words (as well as how to pronounce them perfectly). The vocabulary is conveniently divided into different everyday topics in the form of MP3s delivered in a very pleasant and articulate voice. Therefore, you can use it while commuting, jogging, driving your car, etc. The only downside is that due to it being a “Basic” vocabulary builder, it might not be suitable for more advanced German students who might find themselves fast-forwarding through most of the examples (but that’s self explanatory). Nonetheless, I believe that beginner German students can really benefit from this product and should definitely check it out. This entry was posted in Mein Deutschkurs on 8. September 2010 by Lev. So today was my first DA lesson in about 4 months. Of course, it was difficult to get used to the language again since my German got a little rusty. However, I am positive that things will pick up quite fast. The group members comprised a very culturally diverse environment which made me bring my German up to date (what other choice did I have?) and the German teacher was very helpful and patient with my occasional grammar mistakes. Overall it was a good experience and I am looking forward to my next lesson. This entry was posted in Mein Deutschkurs on 6. September 2010 by Lev.